Paul lived both sides of life. He began life in Jewish Law, and became one of the greatest in his nation at the laws and traditions of Judaism. When the church began and Jesus Christ was being hailed as the Messiah, he was hot on the trial of all who were standing for grace instead of the law to destroy them. By his hands many were killed and persecuted who believed in Jesus. But that wasn’t the end of his story. In Acts 4 we read of Saul on his way to Damascus to murder more Christians - which was the right thing to do - according to his religion. Yet along the way, Jesus himself, already crucified and risen, appears to Paul. The very Messiah that he was fighting against, his highest enemy, appeared right in his path! We cannot know what that looked like or felt like to Paul. Even the men travelling with Paul didn’t see or hear Jesus. But it was enough to make a murderer tremble and fall to the ground! For three days Paul was without sight, either blinded by seeing the glory of God, or blinded at the command of Christ. Regardless of which, his eyes grew something over them that he described to be like scales. For three days he did not eat. We don’t know if that was a fast or if he was so disturbed that he had no appetite. But suffice to say, Paul’s Damascus road moment was a life changer! An encounter with Jesus Christ is always a life changer. Choosing not to leave Paul in blindness, Jesus came to a prophet named Ananias in a vision and commanded Ananias to go to him, providing the exact location of Paul, and give him back his sight. Ananias had heard of “Saul of Tarsus”, the name of pre-salvation Paul. He had a nasty reputation! Ananias was afraid to go to him, even at the call of Christ to do so, because Saul had been given the right to kill anyone who claimed to believe in Christ. Yet, Jesus’ command was clear, and with purpose, saying in Galatians 1:15 “Go, for he is a chosen vessel of Mine to bear My name before Gentiles, kings, and the children of Israel”. 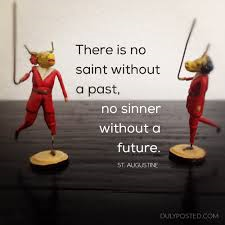 Saint Augustine once said, “There is no saint without a past, and no sinner without a future.” What we fail to understand is that a redeemed sinner is a saint. He may not be a perfected saint, but in God’s eyes, God who looks on the heart and not on the outward appearance of man, the saint is there. Once the Holy Spirit dwells in the heart, the work to perfect the saint begins. Once the Holy Spirit moves in, the sinner will never be the same. Yet, we neglect and shun those that are still in sin. We walk around like we will dirty up our white robes if we come near them. We complain when their children who were not raised in church don’t know how to act in church. We whine like spoiled babies when they take our seats, come in late, or come irregularly to church. We say they’re insincere in trying to find Christ. We judge that they’re “riding the fence” when they fail, and fall into and out of sin. But worst of all, we don’t let them drop the reputation we heard of them before they reached out to Christ. We don’t run to their aid when they fall, and encourage them to keep going. Have we become so self-absorbed and religious that we cannot see the sinner in our past? Ananias looked beyond Saul’s reputation and believed Jesus for Paul’s ministry. He believed he was a chosen vessel, and would preach the gospel of Jesus to many and bring them to salivation. He believed GOD. How many around us could we free from their reputations if we only saw the saint instead of the sinner? How many ministries could be born from the pain of their reputations if we would see God’s plan for them instead of their past? Father God, remove the scales from our eyes so that we can see our brothers and sisters in Christ as You see them. In which work of ancient literature do we first find this expression: "...kick against the goads"? If you said the Bible, in which Jesus appears to Paul on the Damascus Road, you would be wrong. This expression was first used in a book of Greek mythology, "The Bacchae", written by Euripides in circa 475 BC. The expression occurred in a fictional conversation between the god/man, Dionysus, and the king of Thebes, his persecutor. Isn't it odd that Jesus would borrow an expression from Greek mythology in his appearance to the self-proclaimed "Thirteenth Apostle"? Gary - please pardon my neglect to manage my comments. I often think no one is reading and yet, God never lets me stop writing. Bless you for reading and contributing! I had no idea about the goads being from Greek mythology. Yet considering Paul's Greek heritage, how appropriate that Jesus would speak to him in terms he would understand. He is a wonderful, personal Savoir, who relates to us on a personal level. Beautiful to know! Thanks!